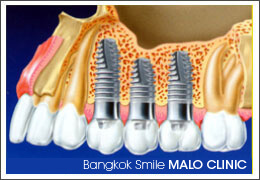 Dental Implants Bangkok | Dental Clinic by Bangkok Smile in Thailand. NATURAL TEETH – Why are they important? Our natural teeth are not only essential for life to chew food, they are also an important element to our harmonious facial expression, and thus of our personal charisma. Distinct, unmistakable facial expressions and untroubled laughter are determined to a great extent by the appearance of our teeth. Having healthy teeth is a vital requirement for our aesthetic appearance and clear enunciation. Whether we like it or not, the condition of our teeth would always be significant by which we and our life circumstances are judged by others. TOOTH-LOSS – What can be done? In the course of a lifetime, teeth can be lost because of caries, gum disease, or accidents. A missing tooth can become noticeable, both functionally and aesthetically, in which our eating habits and our outward appearance are eventually impaired. If we are to have a replacement for our missing tooth/teeth, it would be essential that the method should correspond completely to the natural model with regards to its function and appearance. Missing teeth can be replaced with dental bridges or dentures. For dental bridges, healthy dental enamel is to be sacrificed by grinding of the adjacent teeth for preparation. The gap left along the row of teeth is closed by an intermediate element – however, the lost dental root is not replaced, and this poses consequences for the jawbone, because this will eventually lead to “atrophy” with time as it lacks the pressure from chewing transmitted by the root, which normally stimulates the jaw for constant regeneration. Dentures lead for the same reason to a disappearance of the bone mass – an inescapable atrophy, and the denture has to be constantly adjusted or replaced. The result is a dental fixture, which often fits poorly that would normally impair your quality of life. In extreme cases, this can go as far as generally avoiding social contacts. Implant Dentistry is by far the most advanced approach that yields the most natural-looking and functional results, whether one wants to replace a missing tooth, a number of teeth, or even all them. 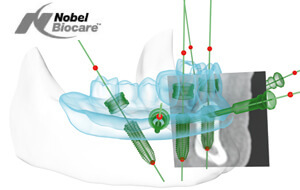 But first and foremost, how do they make dental implants?Watch the video below on how they fabricate dental implants at Nobel Biocare, the world-leader in implant product and treatment concepts innovation. 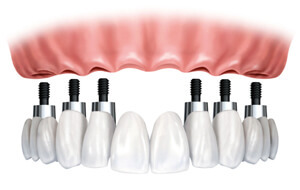 There are a number of benefits associated with dental implants to replace missing teeth. The obvious benefits of an implant treatment include an improved appearance and self-esteem, on top of an enhanced ability to chew and enjoy your food, while providing protection to your remaining teeth and jawbone. 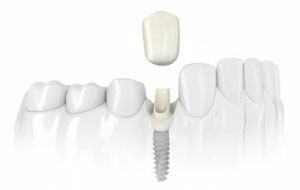 A dental implant is a screw-shaped buttress, which replaces the natural dental root. 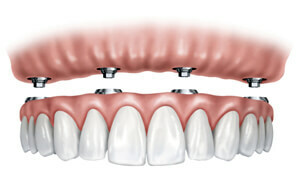 The implant is inserted in the jawbone, where it will be firmly embedded beneath the bone for an average of 6-8 weeks. During this healing phase, the dental implants won’t be covered by soft tissue, so a further surgical procedure will not be required when the abutment and dental crown is attached. 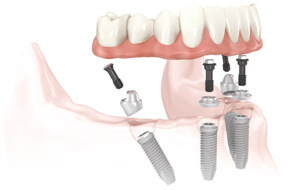 Dental implants are made from commercially pure titanium. Titanium can be integrated to the body’s tissues without complications or allergic reactions occurring. Firm anchorage in the bone allows harmonious adaptation of the gum margin to the implant body, which results in a solid foundation for a reliable and long-lasting dental restoration. What conditions must be met for an Implant Procedure? Basic requirements for an implant procedure include an adequate bone supply with regards to quality and volume, good oral hygiene, and normal wound healing capacity. Before the implant procedure, the natural teeth are usually rehabilitated, and any gum disease is treated and eliminated. Important guarantees of long-term successful implantation are conscientious oral hygiene and regular check-ups with the dentist. What costs can be expected with Dental Implants? 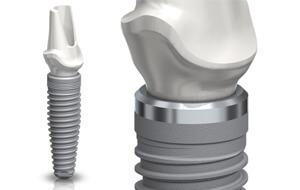 Since every implant procedure represents a completely individual problem solution tailored to the special requirements of each single case, it is not possible to give general guidelines concerning costs. Our implant dentist and oral surgeon comprehensively provide a personal treatment and financial plan for each of our individual patients during initial consultation. Who will carry out the Implant Treatment? A Prosthodontist or a Restorative Dentist trained in Implant Dentistry who will oversee the entire treatment. An Oral Surgeon who will do the surgery to place the implants in the bone. 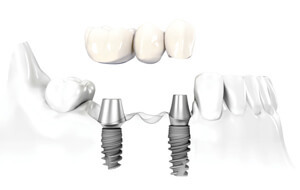 What is the process of an Implant Treatment? How do I know if I’m suitable for dental implants and if it is the best option for me? Everybody’s treatment needs are different. It depends on many factors including your health, the condition of your underlying bone and remaining teeth, if any. It is best that you seek a consultation with a prosthodontist or a dental surgeon because they can objectively evaluate and explain the options with you. How long should I wait after extraction to get my teeth replaced by implants? Ideally, implant replacement for teeth should be planned even before a tooth extraction procedure. Special care will then be taken for the procedure, with bone preservation methods will be performed when required. 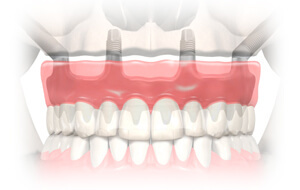 Immediate implant-loading after extraction may also be possible. The amount of bone available tends to shrink with time, and the opposing teeth tend to drift into the space left by the extracted tooth. In addition, the teeth next to the space will also tend to tilt over time, making the replacement more difficult. In general, tooth replacement should be considered as soon as possible after dental extraction. Occasionally, if the infection around the tooth is severe, your dentist may suggest a waiting period of two to three months after the tooth removal. 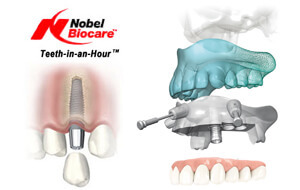 However, the longer you wait beyond this time, the more difficult it may be for the implant placement. How long will I have to wait until I get my teeth? Nowadays, it is possible to receive your teeth on the day of surgery. These are usually acrylic teeth. A final set will be made later. The delay for the final set is due to the fact that the bone supporting the implant actually requires a period of healing before it can be fully loaded. This takes anytime from several weeks to a few months. You may be given a denture or temporary bridge in the meantime. In compromised cases, the waiting time is likely to be longer, especially if bone augmentation is involved. Complex cases may even take up to a few years, especially if you do not wish to have all the treatment at once. Your dentist will be able to advise you properly on this matter.